Is getting more sleep one of your New Year resolutions? If so, well done for prioritising your health, with sleep being the absolute pillar, impacting your physical, emotional and mental health. But perhaps you need to reframe your thinking and rather than aim for more sleep, aim for better sleep. Remember, not all sleep is created equal. Often people quantify good sleep by hours spent asleep, when the quality of sleep is far more important. So how many hours of sleep do we need? The American Academy of Sleep Medicine states working adults should get at least 7 hours of sleep per night. However, this varies between people and can be gauged by how you are feeling during the day. In fact, it is your activity, thinking and behaviour during the day, that is pivotal to how you will sleep at night. Worrying about sleep, is the absolute worst thing you can do for sleep. Ample physical activity, a healthy diet and screen free evenings are all good friends of sleep. Clinical Psychologist Kathryn Smith and Psychiatrist Dr Curt Gray have been effectively treating insomnia with CBT through their long-standing group programme, Towards Better Sleep. Unlike sleep medication, CBT is not a quick fix and takes time to work, which is why the programme spans across 6 weeks, focusing on education, behavioural techniques, correcting faulty thinking and relaxation strategies. A group setting has proven an effective setting to treat people with sleep problems, allowing participants to share their experiences and learn from one another in a more cost-effective way. Silly season is just around the corner and for many of us this means kicking off the heels and having a bit of fun. In essence, this means more food, more booze and less sleep. Sounds like a recipe for disaster, right…for some, it absolutely can be. At risk of sounding like a major kill joy, alcohol is very bad for sleep health, coupled with decadent festive food and a change in evening routine and you’ve got the trifecta of sleep inhibitors. But like all things in life, moderation is the key and one or two bad night’s sleep is not the end of the world, especially if you had fun in the process. In fact, stressing about sleep, is the very opposite of what we preach through our insomnia program ‘Towards Better Sleep’. It is, however, important to recognise, that if you are already struggling with your sleep, be prepared to accept that the festive period may bring some additional challenges. Contrary to popular belief, alcohol does not lead to the mother of all sleeps and this is due to a number of reasons. Whilst having a night cap, may help you drift off into la-la land, your slumber will be rudely interrupted, by an alcohol withdrawal effect. Alcohol has been known to prevent a deeper state of sleep and wakes us earlier than usual, throwing your sleep cycle out of whack. Combined with a higher than usual intake of sugar and fat, albeit via delicious festive treats, and you can kiss a good night’s sleep goodbye. Considering these nights as a bit of a write off, is a reasonable approach, as stressing about how you are going to feel and cope without sleep is counterproductive. Burning the candles at both ends for weeks on end, however, is not our recommended guide to the festive season. 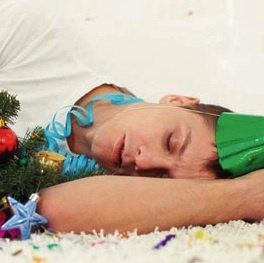 Making some responsible drinking choices and carefully selecting which Christmas function you really want or need to attend, will give you some time to catch up on sleep and resume a healthier regime. Keeping up the exercise, drinking plenty of water and otherwise eating a healthy diet will also help keep things in kilter. After a long year of work, it’s important to take some time to rest, recoup and prepare for the new year ahead. Partying like its ‘99, might not be the best way to do so, with an inevitable full body burn out likely to prevail. Although, the festive period can be fun, it can also bring a great deal of stress with family and financial commitments and end of year work deadlines. Being kind to yourself by getting plenty of rest, taking time to reflect, plan and project, will do amazing things for your mind, body and soul. There are many reasons for the differences in men and women’s sleep architecture, some are psycho-social, some emotional and then there’s the physical. Unfortunately, it’s the physical that women lack control over, particularly with respect to our hormones, with menstrual cycles, pregnancy and later in life, menopause, all wreaking havoc on sleep. Clinical Psychologist and facilitator of sleep program, Towards Better Sleep, Kathryn Smith says; “There is a significant correlation between a women’s cycle and sleep, mainly due to the fluctuation in estrogen and progesterone. The post-ovulatory luteal phase (premenstrual) is where most women experience bouts of insomnia, when night time body temperature is considerable higher and estrogen levels lower, meaning your brain is more sensitive to noise and disturbances”. If you can’t sleep, get out of bed, do something that is non-stimulating and return to be 30 minutes later. In fear of sounding like a broken record, meditation really does help you sleep better. The problem is, many people don’t know how to meditate and don’t prioritise the time for it. Insomnia is complex, as it’s not just a physical disorder; it encompasses our whole being including our emotional and psychological state. That is why worrying during the day about a lack of sleep is counterproductive and will only heighten anxiety levels at night. According to the Medical Journal of Australia, recent surveys reveal that between 13 – 33% of the adult population regularly has difficulty either getting to sleep or staying asleep. But perhaps if more of us jumped on board the self care bandwagon we might find ourselves catching more zzz’s. It is no secret that stress and anxiety can cause sleeplessness but the cause and effect relationship can sometimes be difficult to diagnose. Having an anxiety disorder can cause insomnia and sleep problems but new research suggests ongoing insomnia can also lead to anxiety disorders. By definition insomnia describes people who have trouble falling asleep, staying asleep or waking prematurely without the ability to fall back asleep. Ongoing sleep dysfunction often leads to a cycle of stress and anxiety during the day about being able to sleep at night and exasperates the problem. Lest We Forget will be pledged across the nation this Anzac Day as we approach 100 years since Gallipoli but for many of our veterans and ex-servicemen, forgetting the unforgettable seems a challenge too great. Trauma regularly touches our community. Watch the evening news and you will witness traumatic events like car accidents, assaults, hold ups, natural disaster, terrorism and war. Experiencing a traumatic event or the atrocities of war can have a marked impact on people’s lives. While most people are able to recover from trauma, others go on to develop psychological disorders such as posttraumatic stress disorder (PTSD). Everyone likes to have a good night’s sleep, but not everyone sleeps well all the time. John is 43 and divorced from his wife five years ago. He came to Psychology Consultants indicating he had been chronically unable to fall and stay asleep since he divorced his wife. John reported going to bed early and watching television in bed. He admitted to worrying about his sleep loss during the day and believed that ‘something bad’ would happen to him if his sleep continued in this way. John’s scenario is common. Insomnia affects one in ten people sometime in their life – often following a significant event. What can I do to get to sleep? This is one of the questions we are most frequently asked. Irrespective of a client’s other problems, sleeping difficulties are usually also present, either as a part of their primary condition or as a disorder in its own right. Sleeping difficulties can have major adverse effects on a person’s life. Such difficulties can lead to psychological distress, impairment in daytime functioning, involvement in fatigue-related error-making or accidents, increased use of sick leave, greater irritability and depression, and prolonged use of minor tranquillisers. Clinical Psychologist, Kathryn Smith and Psychiatrist, Dr Curt Gray have been running the Towards Better Sleep group insomnia programme for over 10 years. The programme runs in a group setting over the course of 6 weeks from Psychology Consultants, Morningside. For more information on the programme, visit the Towards Better Sleep page.